How can I Clear a TPM module or Recover from Authorisation Lockout? TPM Modules can become locked when too many incorrect PIN attempts are made to access the information stored on the module. The number of failed attempts before lockout will vary depending on the TPM version (1.2 or 2.0) and in the case of TPM 2.0, the policies configured in the operating system. If your system has TPM 2.0, then by default you need to wait 2 hours after lockout before re-attempting the correct pin, or wait 64 hours for the pin attempts to be completely forgotten. If you have replaced the motherboard in your Bitlocker protected system and the new motherboard arrives with TPM provisioned, you may be locked out from TPM as you will likely not know the PIN, or you may not be able to re-provision the TPM for re-use. Check that you don't have manufacturer TPM drivers installed (always use generic Microsoft TPM software). In the case of Windows 7 x64 and TPM 2.0, make sure you are running the BIOS in UEFI mode. If you have replaced the motherboard, ensure that the motherboard BIOS is up to date. You will need the TPM owner password or owner password file (.TPM). If you have protected your system with Bitlocker and cannot boot the system to get TPM.MSC, then you will need to boot the system from an alternative, non-encrypted drive. Click on Reset TPM Lockout. To get around a TPM module which has been locked out from too many incorrect PIN attempts, and you don't want to wait for the lockout period to end or you don't have the owner password / password file. Or with a TPM module which cannot be re-provisioned, for example after a motherboard replacement. Note: Bear in mind that this will delete the cryptographic information in the machine and you will lose the encrypted data, including any user data or documents stored on a Bitlocker protected drive. Clearing the TPM can be done one of four ways, each of which increase in complexity. Always log on with local Administrative rights before using these instructions. In the BIOS, usually under the Security section, use the option to clear the TPM. This action cannot be reversed and will result in the loss of any encrypted data - for example, you will then need to reimage the machine and re-encrypt the drive. If your BIOS does not have the option to clear the TPM, then you will need to clear the TPM using Windows. When the system reboots you will be prompted to ensure that you want the TPM cleared. Attempting to clearing the TPM without making any other Windows changes first, as in Step 2., may not be successful. This is because some versions of Windows have safeguards to prevent the accidental erasure of cryptographic information. The first change to make if Step 2. is not successful is to change the Windows TPM Delegation Level. 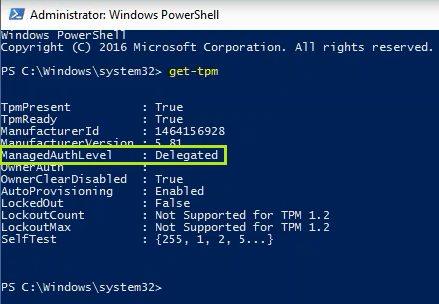 Check the Delegation Level by running get-tpm from inside an Administrative PowerShell prompt. Not that the default ManagedAuthLevel is Delegated. This needs to be changed to Managed. Browse to Computer Configuration > Administrative Templates > System > Trusted Platform Module Services. Double click on the setting Configure the level of TPM owner authorization information available to the operating system. Change the setting from its default of Not Configured, to Enabled. Then, in the options, change the Operating system managed TPM authentication level to Full. 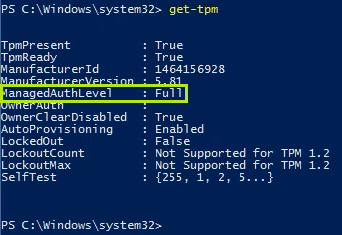 You can now check that the Managed Authorisation Level has taken effect, by running get-tpm again from the Administrative Powershell prompt. Now re-attempt clearing the TPM using the MMC as in Step 2. 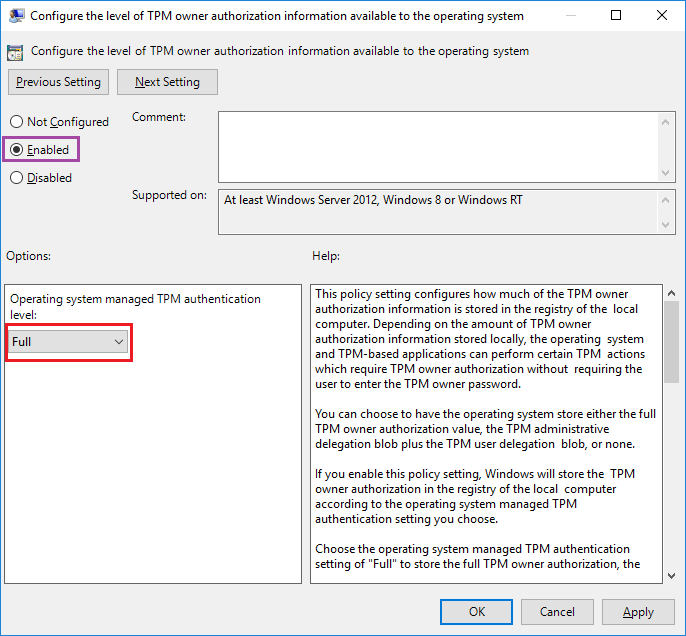 If this method is successful, if you carry on using the same installation of Windows, you should then change the TPM owner authorization Policy back to Not Configured, to allow the default of Delegated to take effect. Note: In the above screenshot, the TPM is not reported as locked out. If you are unable to provision a new TPM, the TPM may be an indeterminate state where is it not locked, but cannot easily be cleared unless you use the additional instructions in Steps 3 or 4. 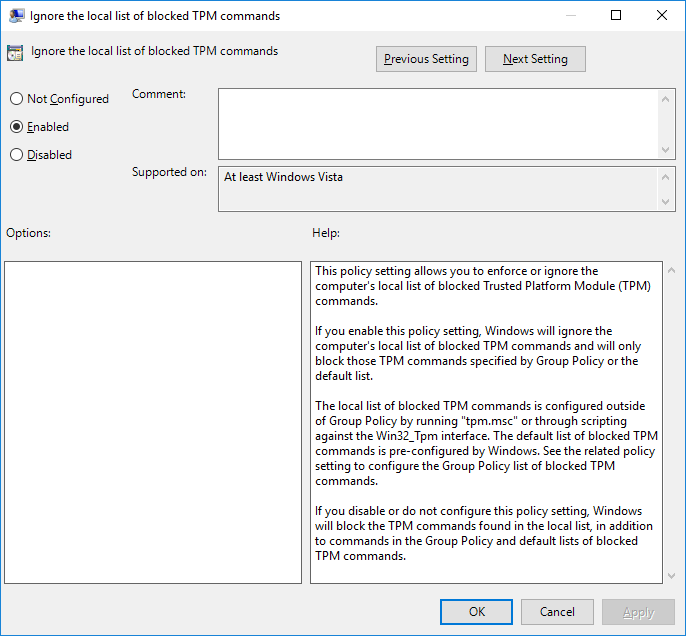 Windows by default blocks the use of some TPM commands to prevent abuse. If the instructions in Step 2 do not work, you may need to de-restrict the TPM commands that can be used. Using MMC, open TPM Management for the Local Computer. 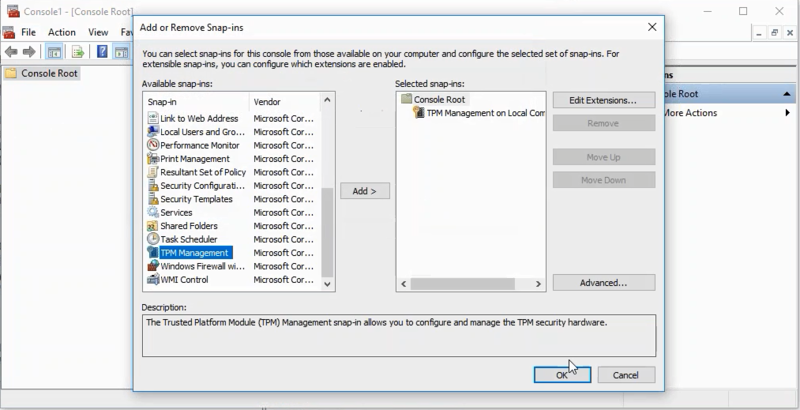 Double click on TPM Management on Local Computer, to get to Command Management. 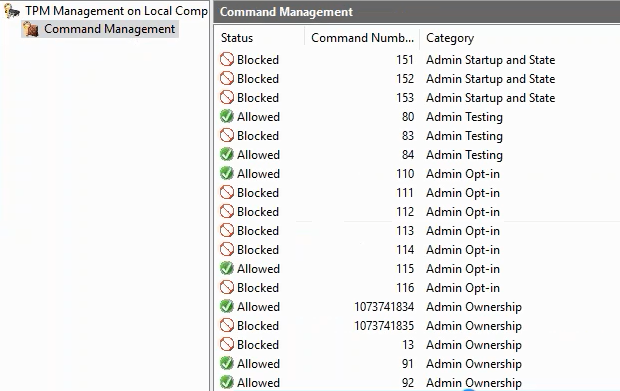 Click on Command Management and confirm that some or all TPM commands are blocked from use. 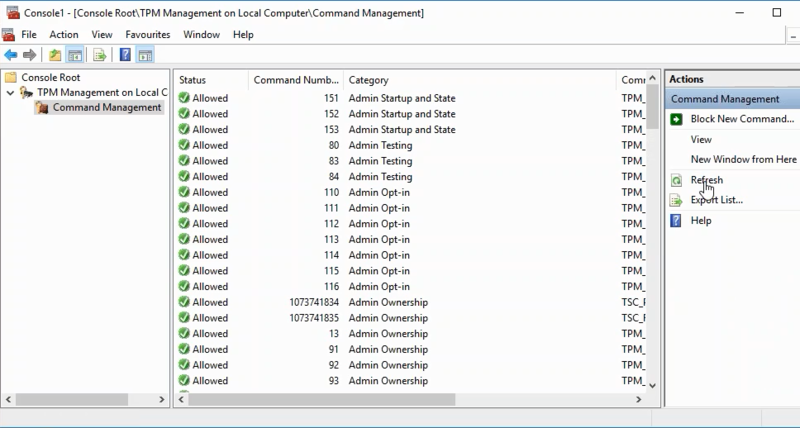 To enable the blocked commands, you will need to make changes either Group Policy (if your settings are centrally administered) or through the Local Policy. Double click on Ignore the default list of blocked TPM commands, and change it from the default setting of Not Configured, to Enabled. Do the same for Ignore the local list of blocked TPM commands - change this to Enabled. You should now have three settings configured, as below. 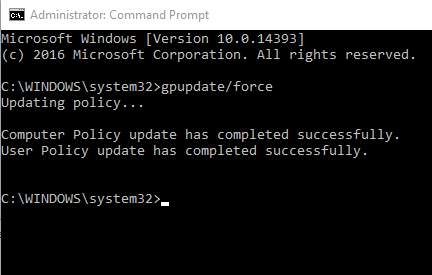 Again, update the local policy usage by running GPUPDATE /FORCE from an Administrative command prompt. Check that all TPM commands are now available. To do this, go back to the TPM Management MMC. Under Command Management, click Refresh on the right hand side. Confirm that all commands are now Allowed. Re-attempt Clearing the TPM using Step 2. 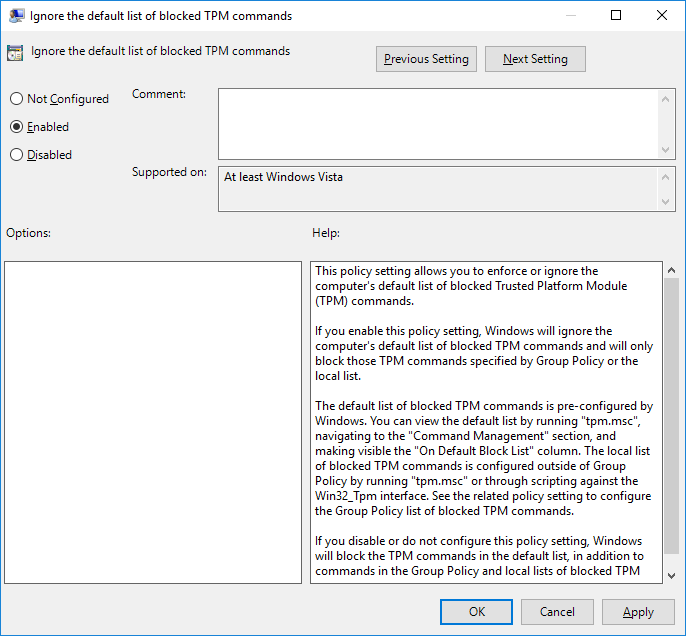 If this method is successful, if you carry on using the same installation of Windows, you should then change the settings of Ignore the default list of blocked TPM commands and Ignore the local list of blocked TPM commands back to Not Configured. How can I Enable or Disable Bluetooth devices from the command line in Windows? It is possible to Enable or Disable devices from the command line using the Microsoft Devcon utility. This simulates device manager functionality. Download the Devcon package from here to your Desktop or Downloads folder. Extract the Devcon package by double clicking on the download. Extract the files to a sub-folder called "devcon extracted". Then copy the "devcon.exe" file from the i386 subfolder inside "devcon extracted". Paste the devcon.exe file into a new working folder called "BT utilities"
Download the "enable or disable devices.zip" file attached to this article and extract the contents into "BT utilities"
Modify the enable_BT.cmd and disable_BT.cmd files to include any additional device IDs that you might need. Make the "BT utilities" folder available over the network, and test it. You may be able to deploy this utility using group policy but bear in mind that any device manager operations, including those called by the Devcon utility, may require Administrative rights. Note: If you deploy this utility using group policy please test it thoroughly to ensure that the script does not distrupt your user's experience. The utilities attached can be used for any device ID or IDs, however the specific devices controlled by the example script attached are the Intel bluetooth controllers included in their Mini-PCI wireless cards up to July 2013. Some of the DMI strings in the Intel desktop board BIOSes can be changed using the utilty attached to this article. To run the utility, you will need a Windows 98SE bootable USB pen drive. Make the USB pen drive command prompt bootable. Disable UEFI boot in the BIOS, if enabled. Extract the utility to the pen drive. Boot the system from the pen drive (use the F10 option to get the boot menu). System serial number (this should be the serial number on the Stone serial number sticker). Bay Number (normally this is not used; Stone systems may have a QC tracking number here). Chassis Asset Tag (this should be used for the end-customer asset tag number). ​This DMI utility will also program "OEGStone" into the BIOS as a manufacturer string. Start the system back up and re-enable UEFI boot in the BIOS if it was previously enabled. Some of the DMI strings in Stone N108 Netbooks can be changed using the utilty attached to this article. To run the utility, you will need a Windows 98SE bootable USB pen drive. Make the USB pen drive bootable. Stone Computers systems USB 3.0 ports can be recognised by the blue colour of the USB port connector. This is an industry standard. Use the USB 3.0 ports to take advantage of much faster data transfer rates compared to USB 2.0, when used with devices that support this standard. Note: USB 3.0 ports are backwards compatible with USB 2.0 devices, and vice-versa. To get the best performance from your devices, always plug USB 3.0 capable peripherals into USB 3.0 ports. All Stone PCs and laptops from 2011 that include USB 3.0 controllers (6 Series chipsets and later). When logging a support call with Stone Computers Service helpdesk, one of the details that we need to identify the machine is the Serial number. This is usually found on a silver Stone sticker (underneath the bar code) on the case. For any reason this number has become faded over time due to use, you are able to access it through the command line as below. This will then query the bios for the system serial number and return it in the command line. Tip: Alternatively, use the Stone WMI tool to get the serial number as well as other additional BIOS information, including BIOS version and UUID. Important: The instructions in this article are for advanced users only, or experienced IT personnel. It is not recommended to perform a BIOS update on your Classmate 3 unless you have a specific issue which can only be rectified by a BIOS update. If you require assistance with any issue, please contact our support team first. As of November 2014, there is now a BIOS update available to support the new USB 3.0 / Gigabit LAN Adapter, CABUSB-224. This is version 1.04. (This is seperate to the previous update for the touchscreen firmware for early units - see related articles - however the update for the touchscreen is not related to the main BIOS). The original BIOS 1.00 (dated 2014.0606) was shipped on systems until the end of November 2014. To flash the latest BIOS 1.04, an intermediate BIOS version 1.02 must be installed first. To perform the flash, the EFI System Partition must be present on the hard drive. This means that the hard drive/SSD/flash module must be fitted and working before the BIOS can be updated. Once you have an EFI system partition, the BIOS update(s) can be performed either in the EFI Environment or the Windows PE Environment. BIOS 1.04 has an optional dock firmware update ("dock_V106"). This firmware update is only applicable to the original dock models which use an orange power connector. This update can only be done in Windows PE or full Windows. It cannot be done inside EFI. Additionally, BIOS 1.04 has an optional tablet EC firmware update ("Tablet_V106"). This can be applied to any model that was shipped before December 2014. This update can only be done in EFI. It cannot be done inside Windows or Windows PE. Download the BIOS 1.02 file and extract it to a FAT32 formatted USB pen drive or a folder on your Windows PE boot pen drive. Connect the AC Adapter and power on the system. Use Windows Disk Manager to determine if the system has an EFI System Partition (ESP). If does not, for example if the chassis is new or the system has been completely erased, you will not have an ESP partition and one will need to be created. If the system still boots a Stone factory software image, the ESP partition should be present. Tip: If you have the Classmate 3 Windows PE boot pen drive, it may be a good idea to store the BIOS update files in a directory on this pen drive. This way, if you have to use the Windows PE boot to create the EFI System Partition (ESP) you can then proceed with the flash process as soon as you have finished making the partition. This option is quickest if the system is already booted into Windows or Windows PE. Repeat the process using BIOS 1.04. Flash the BIOS 1.04 V106 Dock update if the dock has an orange power connector. Simply run the EXE as an administrator. If the dock does not have an orange power connector, this update is not required. Flash the BIOS 1.04 Tablet V106 update - this will need to be done in EFI. Run FEC.NSH. Note: The BIOS flash process is completed after a system reboot. 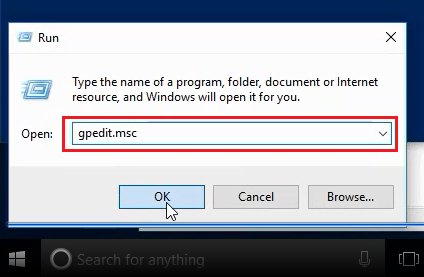 This option is quickest if you don't have an Administrative logon to the copy of Windows that is installed, or don't want to wait to boot full Windows. Again, the EFI System Partition needs to be present. If you have the EFI System Partition, when you boot to the EFI Shell the pen drive will be available as FS1:. If you do not have an EFI system partition the only drive available to you will be FS0:, and you will need to create the EFI System partition using a bootable Windows PE drive. Choose the option to boot the Internal Shell. Type in FS1: <enter> to change the Shell prompt to select the USB pen drive you have inserted. If this doesn't work, type in MAP -R<enter> to attempt to scan for devices again, and then try FS1:<enter> again. If this still doesn't work, try the pen drive in the other USB slot, or try a different USB pen drive. Type Shellflash to start the flash process. Once the flash is complete, repeat the process using BIOS 1.04. Flash the BIOS 1.04 V106 Dock update if the dock has an orange power connector. This will need to be done in Windows - simply run the EXE as an administrator. If the dock does not have an orange power connector, this update is not required. Note: The flash process is completed after a system reboot. If you get an error message about ESP, or the flash process fails at the point of "Reading the file", you likely don't have an EFI system partition. Create the partition, and repeat the flash process. Other reasons for failure in flashing include already having the same BIOS installed. The EFI System Partition (ESP) is a reserved partition on the hard drive (which could be a mechanical or flash based drive) which some EFI tools, including BIOS update utilities, can use to store code. Note: Creating the ESP using the method below is recommended on systems that have no operating system, as the instructions below will erase the contents of the hard drive. A specific download of Windows PE is available which includes support for the Classmate 3 Intel drivers, to allow the keyboard and mouse to function in the PE environment. On a system used for IT administration (for example, not the Classmate 3 itself) download the package which contains the image and the image writing program. Attach a blank USB pen drive of at least 2GB in size to the system. Install the imaging program and then run it. 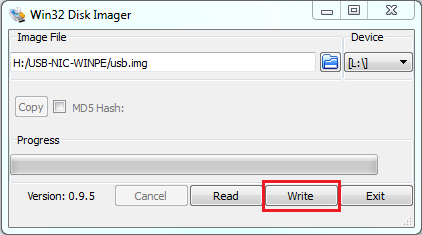 Select the .IMG file and the drive letter of the USB pen drive. Click the Write button to write the image to the pen drive. Download the BIOS file and extract it to a folder on your newly created Windows PE boot pen drive. Connect the pen drive prepared above to the Classmate 3. Power the Classmate 3 on and immediately use the F11 key to get to the boot menu. Remember: Creating the ESP above is a destructive process that will erase the contents of the first system hard drive. If you extracted the Classmate 3 BIOS update files to the pen drive, you can now re-attempt flashing. No reboot is required in-between creating the ESP and re-attempting the flash. BIOS 1.00 0606 Original Stone Logo BIOS (this is the original shipping BIOS until November 2014). BIOS 1.02 Intermediate BIOS (this BIOS must be installed before you can update to BIOS 1.04; this is not a Stone Logo BIOS so machines should not be left running the BIOS). BIOS 1.04 Stone Logo BIOS (includes "dock_v106" for docks which have an orange power connector, and "tablet_v106" - an EC update for all models shipped before December 2014). Combined BIOS Package 1.00 to 1.04 - All BIOSes and Firmwares (includes all of the above and the touchscreen update for early units with unresponsive touchscreens). BIOS Updates are available for the Stone NT210-H Haswell based laptop. Note: Please only update the BIOS if necessary. The BIOS should not be updated unless you are experiencing a specific issue which requires an update. This BIOS update is designed to be used by Administrators. Contact Stone Support for further advice. Extract the downloaded file to the pen drive. Ensure that the system to be updated is connected to the AC mains and also has a battery level of at least 20%. Boot the system to be updated from the pen drive. Run ECFLASH to update the EC Firmware. Then shut the system down if it doesn't turn off automatically. Boot the system up again and start it again from the pen drive. Run the FLASH batch file to flash the main BIOS. Note 1: Do not attempt to use this BIOS update procedure inside a "DOS" box or command prompt inside another operating system. Always run all parts of the update from a pure DOS boot. Note 2: Always ensure that the laptop is connected to the mains and that the battery has at least 20% charge before attempting to perform the flash. The product referenced on this page is impacted by this security issue. Due to the age of the product, a BIOS patch or Management Engine update may not yet be available. Please follow the mitigating actions highlighted here. BIOS Updates are available for the Stone NT310 laptop which add support for Windows 8.1. The system should reboot. If it does not, reset the system. Boot the system from the pen drive for a third time. Run the FLASHME batch file to flash the main BIOS. Stone NT310 Laptop - NOTCHA-256, NOTCHA-257, NOTCHA-261 and NOTCHA-262. BIOS Updates are available for the Stone NT310-H Haswell based laptop. When the flash has completed, shut the system down, if it does not shut down automatically. Stone NT310-H Laptop - NOTCHA-260 and NOTCHA-265. A BIOS update is available for the Stonebook Pro and Stonebook Lite Skylake based laptops. This BIOS introduces UEFI support for Windows 7 installations. UEFI support is required for TPM (2.0) functionality on these models with Windows 7, due to a Microsoft limitation. You will need a copy of the BIOS file and then decide which one of the two methods to use, below. We recommend that you use the Windows 98SE DOS Bootable Pen drive method, however a Windows Flash is also available. Run the FLASH batch file to flash the BIOS. Note: With this method, do not attempt to use this BIOS update procedure inside a "DOS" box or command prompt inside another operating system such as Windows 10. Always run all parts of the update from a pure DOS boot. Login to the system to be updated as an Administrator. Extract the downloaded file to C drive of the machine to be updated. Do not attempt to use the flash files from a network location. Open the location containing the extracted files. Run the WINFLASH batch file to flash the BIOS. ​This will automatically detect if you are running on x86 or x64 Windows and run the right flash utility accordingly. Always Note: For both methods, always ensure that the laptop is connected to the mains and that the battery has at least 20% charge before attempting to perform the flash. I have installed a 3G Card and inserted a SIM card - why isn't it detected in Device Manager? I have a 3G card installed in my Stone/Clevo notebook and I have a compatible SIM card inserted, but the 3G card is not shown in Device Manager, preventing me from using it to connect to the Internet. It is possible that the 3G capability on the notebook is switched off, in a similar way that the Wireless Network adapter can be switched on and off by using a function (Fn) key. The 3G capability can be switched on and off using the key combination (Fn + -). Note: You may be unaware that the 3G functionality can be switched on and off in this way, as there is no labelling on the keyboard to suggest this. N1xx and NT3xx series products with 3G cards installed. I need to extend the battery life on my Stone Computers laptop as I am planning to travel. Is this possible? Stone Computers laptop systems support the latest power-saving techniques when manufactured to extend the battery life, or run-time. You will need to configure your operating system to enable these technologies. Instructions for Microsoft Windows 7 are below. Click on the Power Saver power plan to activate it. This will dim the screen slightly, and also reduce the laptop performance slightly to make it as efficient as possible, to increase the battery run-time. Note: We recommend during normal use that you use the Balanced power plan as this will provide optimum performance. Is my Stone PC 64-bit compatible? What are the benefits? All current Stone PC systems (with exception of some netbook and tablet products) are 64-bit Windows capable. 64-bit capable systems allow a 64-bit version of Windows to address more memory, whereas traditional 32-bit systems were limited to 4GB of memory. If your system has more than 4GB of memory you will need to be running 64-bit Windows to take advantage of this increased capacity. Note: Intel Atom based desktop products (as well as Atom based netbooks) are also only suported under 32-bit Windows, meaning that they cannot make use of more then 4GB of system memory. All desktop, laptop, netbook and tablet products. My Laptop or Tablet Battery does not Last as Long as it Used To - Is it Faulty? Our branded laptops and tablets are available with some of the best service offerings available in the industry, including next business day service options for a length of up to five years. The batteries on Stone branded product are warranted for a maximum of three years. This protects you against manufacturing defects or outright battery failures (such as the battery not being detected). However, like most battery warranties today there are some limits or exclusions; these are based upon the technology used to produce modern batteries. Lithium-ION (LI-ION) batteries do not suffer from the memory effect problem of earlier generations of battery technology. However, LI-ION batteries do suffer from loss of original battery capacity over time. This is irrespective of the amount of use and irrespective of where or not the battery has been stored in a discharged (flat) or charged state. The amount of capacity loss varies, but on average it equates to between 20% and 30% of the original battery capacity per year. This means that at the end of two years, for example, the battery capacity may have reduced in the amount of runtime available from between 40% and 60% from the original level. This is the standard expectation of LI-ION battery capacity performance across the industry, and this is the reason that notebook batteries are now generally classed as consumable items. Reductions of battery capacity over time are not covered by the battery warranty. What Can I do to Minimise the Reduction of Capacity? To protect the battery as much as possible, protect the equipment from extremes of temperature, especially temperatures below freezing or above 30C. For example, do not leave the equipment exposed outside, and do not leave the equipment in direct sunlight. Also avoid placing the equipment directly above or in contact with radiators or other strong heat sources. Other Recommendations: Always use the correct charger to charge the equipment. Replace any chargers which become damaged. If your laptop has a removable battery is not going to be used for a period of time of more than 4 weeks, consider storing the laptop with the battery removed to prevent "dead" batteries - deeply discharged batteries which will not respond to normal charges. Customers that need long battery run times after two or three years of battery use may wish to consider buying replacement batteries. Your Stone Account manager will be able to advise you on price and availability. Tip: If you need to lengthen the amount of time your Windows based laptop or tablet can run on battery, consider changing the systems power plan to the "Power saver" plan to maximise runtime. Use of third party laptop chargers on Stone branded laptop products is supported but only when an appropriate charger is used. Use of a charger of the wrong rating or connector may void your product warranty, and may cause product damage. DO use a charger of the same or greater power output, either in watts (W) or amps (A). DO use a charger that provides a regulated output. Most laptop chargers do provide a regulated output, however many low cost generic power adapters (i.e. power adapters not built specifically for laptops) do not provide a regulated output. We recommend the use of branded charges which clearly show the CE Marking, and show if the device is Class 1 or Class 2. 18.5V 3.5A No. The voltage is too low (18.5V), so even though the total power output is sufficient the adapter should not be used. 19V 4.74A This adapter supplies the correct voltage (19V) and can supply ample current (4.74A is more than 3.42A). This adapter can be used as long as the connector size and polarity exactly matches the old adapter. 24V 3.42A No. The voltage is too high (24V). V = Volts, or voltage. Measurement of electrical pressure. A = Amps; measurement of current or electrical flow. W = Power in Watts - total power derived by multiplying the voltage (V) and amps (A). Note: If you are unsure as to the suitability of a replacement third party AC adapter please contact support before using the adapter. Alternatively, Stone may be able to supply you with a replacement adapter. Some notebook or tablet chargers have an LED directly on the charger itself. This LED is only useful to tell you that there is mains present (for example, that the fuse is OK). If the LED is not functioning, AC mains could still be present but the charger has failed. Conversely, even if the LED is illuminated, this does not guarantee that the charger is fully functional. Never attempt to repair a mains adapter yourself. The only user replaceable components is the mains fuse on the mains lead, and the mains lead itself. There are three levels of BIOS password on Stone notebooks from the 2012 model year onwards. Supervisor. If you set a Supervisor password and then attempt to enter the BIOS, you must enter this password to gain access to all BIOS settings including UEFI and SATA mode. If you do not enter the Supervisor password correctly, and have not set a User password, you will automatically get User mode BIOS privileges. User. The User mode gives access to all BIOS settings except UEFI control and SATA mode control. If you intend for your users to have this level of access, you should set a Supervisor password to prevent users automatically getting access to all BIOS settings through Supervisor mode. If you set a Supervisor password and then attempt to access the BIOS, you will be prompted for a password. If you skip entering this password - i.e. you just press the Enter key - you will be given User mode privileges in the BIOS unless a User mode password has previously been configured. If a User mode password has previously been configured, then you must enter with the Supervisor or User password to gain any access to the BIOS. What is a Dead Screen Pixel? Is it covered under Warranty? What is a Dead, or Stuck Pixel? All modern flat panel screens are made up of tiny lit elements known as pixels. These pixels use combinations of red, blue and green light to build images on the screen. It is a fact of the technology that even despite the highest manufacturing standards, that sometimes it is possible to receive a new screen and have a dead pixel. This could be visible as a pixel that is constantly white, constantly black, or partially stuck - for example, it might be a stuck on as red, blue or green. Example: The example below shows a dead, or stuck pixel. In this case, the pixel is off, or black. What Is the Pixel Policy Standard? Manufacturers make equipment to an international standard (called ISO 13406-2) so that users receive the experience that they expect. Most equipment that Stone supplies is known as Class II equipment as regards pixel policy. Details of what the policy is are covered below. It is only when you have a number of dead pixels over the amount specified in the table is the product deemed to have fallen short of the standard. ISO 13406-2 Class II Pixel Policy - How Many Faulty Pixels Can there be? W/B Clusters: How many white or black stuck pixel clusters are permitted: 0. R/G/B Clusters: How many Red/Green/Blue semi stuck pixel clusters are allowed: Up to 2. ​These numbers are all per million screen pixels. On a standard 15.6" laptop screen that has a 1366x768 resolution, there are just over one million pixels, so the above numbers apply exactly. So, am I Covered by Warranty? Stone is proud to deliver excellent products and customer service, and as such we support our partners and suppliers with this pixel policy. If you receive a product that is outside of this policy please let us know within 30 days so that we can get the unit exchanged under our dead-on-arrival (DOA) facility. If you have a single black or white stuck pixel, then usually this is not covered. Please do not hesitate to contact our Support team if you are unsure if you are covered or not. What is Flight Mode? Why doesn't the wireless LAN indicator work on my laptop? Flight or Airplane mode on modern laptops is a setting than can be used to ensure that all of the laptops internal wireless, bluetooth and 3G/4G connectivity is turned off. Laptops such as the Stone NT310-H and newer have a Wireless Flight mode status indicator which works the opposite way around to previous Wireless LAN indicators. When the Flight mode indicator is lit, wireless radios are disabled. When the Flight mode indicator is off, flight mode is off and the wireless radios will work. Use the keyboard hotkey on the NT310-H of Fn + F11 to toggle Wireless Flight mode on and off. This functionality works in both Windows 7 and Windows 8.x. My Flight Mode LED Does Not Work. Why is this? If you do not get an on-screen message regarding flight mode or wireless status, or if the Airplane LED stays on or off when you press Fn + F11, this is because you have not installed the Hotkey Utility. Install the Hotkey utility to get on screen messages about most function keys, for example, audio settings. The Hotkey utility also controls the Airplane mode LED. Download the Hotkey Utility from the Stone Driver Finder. Ensure you install the latest version available for your model and operating system. In addition to Fn + F11 support Windows 8 and 8.1 support a Wireless Flight mode toggle via the Charm Bar - Open the Charm Bar, go to Settings, then WiFi. Stone NT310-H Laptop (NOTCHA-260 and NOTCHA-265). Where can I get an updated system BIOS for my Stone system? Do I need to update my BIOS? We do not recommend that you update your BIOS unless you have a specific problem that needs resolving. In this instance, please contact Stone support for assistance. We can help you diagnose any problem, and can give you all of the information you need for any BIOS update. If you would like to try the BIOS update on your own, these are made available when necessary on the Stone driver finder - Stone Driver Finder. Note: BIOS files available on the driver finder will not include any BIOS customizations that may have been set up for you when you purchased your machine. Please make a note of important BIOS settings, such as SATA controller mode (AHCI or IDE mode) before attempting the upgrade.